This post is sponsored by Blue Diamond Almond Breeze Almondmilk. Oh man, the Winter Solstice is officially less than a week away now, and I am counting down the daaaayyyysssss. Because, I don’t know about you, but I am so ready for a little more daylight in my life! But man, there’s still something about walking outside to a pitch black sky at 4:57pm that has a way of zapping the energy out of me. And all I want to do is stay in for the night with some comfort food, a warm drink, a cozy blanket, and watch 3.6 episodes of Mad Men with Barclay. Well, actually, no complaints there either. Those have turned into some of my favorite date nights! And since the two of us are beyond hooked on the show right now as we’re nearing the final season, they seem to be happening more and more lately. So as much as I hate to say it, maybe these pesky dark winter days are well-timed with our Don Draper-a-thon. Still, there’s something about dark evenings that zaps some of my motivation to cook. So on the nights when we stay in, I’m busting through my repertoire of all things “quick and easy”. 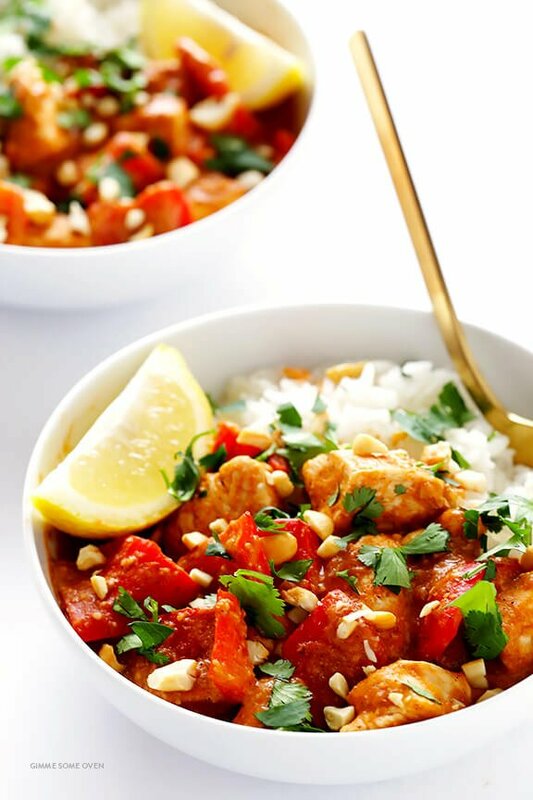 And one of my new favorites is what I fondly call “curry in a hurry” — this delicious Cashew Chicken Curry. 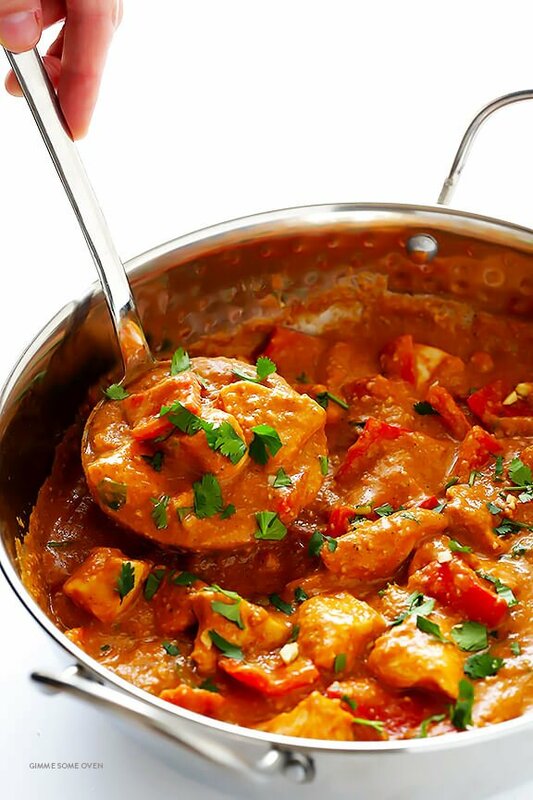 I’ve been craving Indian food more and more lately, especially with those rich and warm flavors that seem like the perfect comfort food this time of year. And upon realizing that I had an overabundance of cashews in the house (I’m my daddy’s girl — he and I are obsessed), and a carton of the brand new Almondmilk Cashewmilk Blend from Blue Diamond Almond Breeze that I’ve been wanting to try, I decided to combine the two to make a very simple chicken cashew curry. The beautiful thing about this new almondmilk cashewmilk blend is that it is super rich and creamy (even more thick and creamy than almondmilk), and the flavor is perfectly sweet and delicious. So since I was planning to bring some of the leftovers to a neighbor who is dairy-free, I decided to nix adding any traditional yogurt to the recipe and just go with the almondmilk cashewmilk blend all the way. Also — I have some fun news! 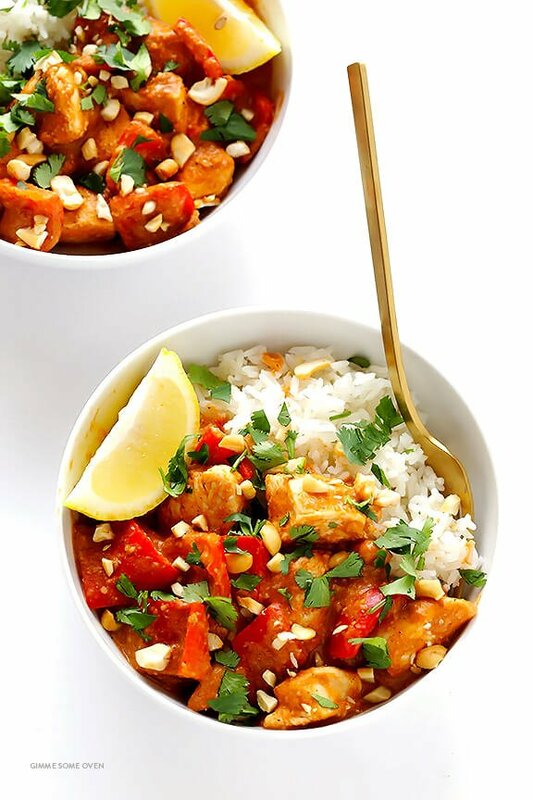 This Cashew Chicken Curry (In A Hurry!) 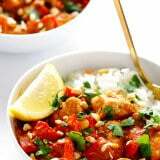 recipe is quick and easy to prepare, and full of the most rich and delicious curry flavors! Heat oil in a large saute pan over medium-high heat. Add onion and saute for 4-5 minutes or until it is soft and translucent, stirring occasionally. Add the garlic and saute for 1 minute, stirring occasionally. Stir in the flour until combined and saute for 1 minute, stirring occasionally. Gradually in the almondmilk cashewmilk blend until it is combined. Stir in the remaining ingredients (tomatoes, garam masala, chili powder, cumin, ginger, turmeric and cashews) until combined. 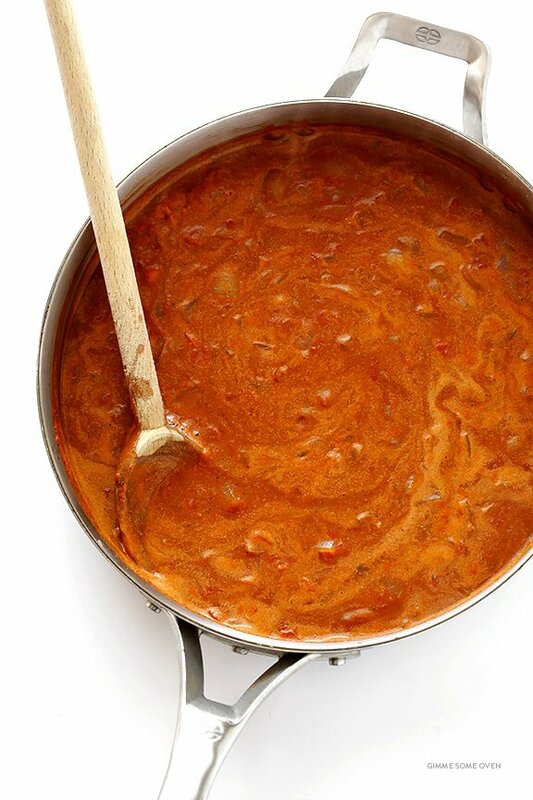 Continue cooking the sauce until it reaches a simmer, then let it simmer for 1 additional minute until it has slightly thickened. Taste and season with salt and pepper, to taste. 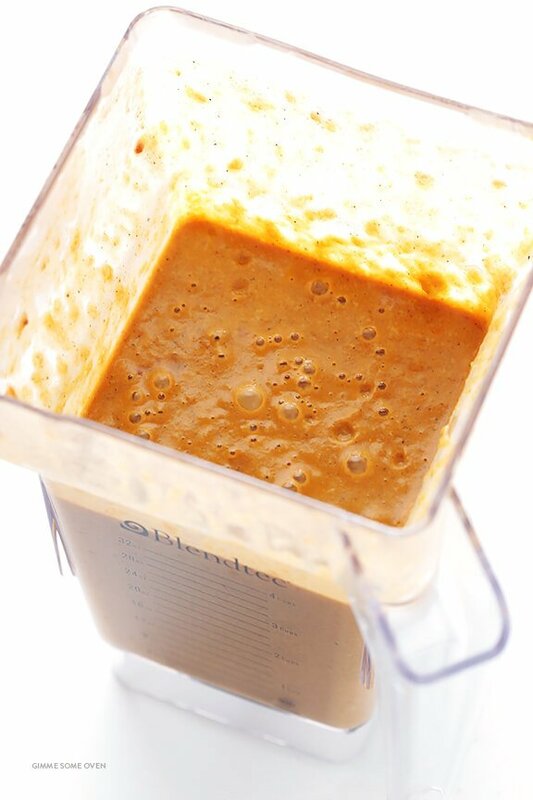 Remove the sauce from the heat and either (a) transfer it to a blender and pulse for 1 minute until smooth, or (b) use an immersion blender to puree the sauce in the pan until it is smooth, or (c) you can also just leave the sauce as-is, which will be a little chunky. Begin by making the sauce as directed in the instructions above. Once the sauce is ready, rinse out your saute pan, and return it to the stove. Heat the olive oil over medium-high heat. 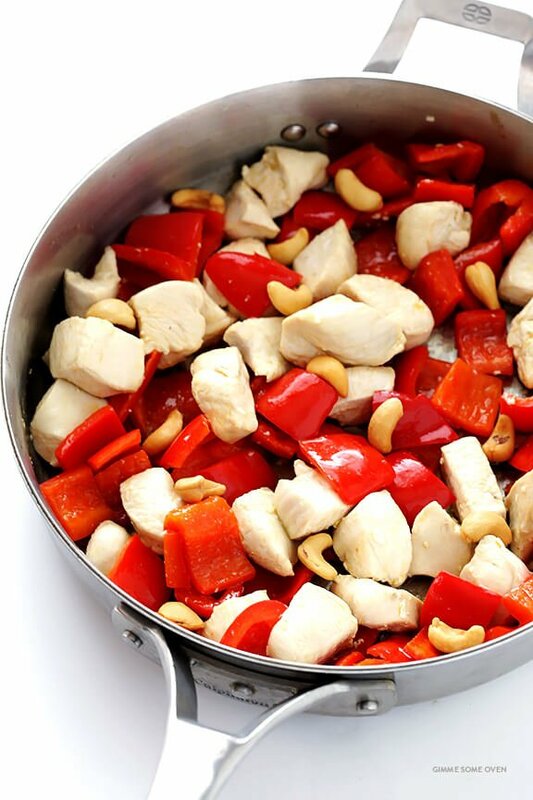 Add the chicken breasts, bell peppers and cashews, and season with a few generous pinches of salt and pepper. Saute for 5-7 minutes, stirring occasionally, until the chicken is cooked through and no longer pink inside. Then pour the prepared sauce on top of the chicken mixture, and toss to combine. Serve immediately over rice** (or quinoa, or naan, or you can even serve it just plain), garnished with your desired toppings. *You could also use the Almond Breeze Almondmilk Cashewmilk Original variety if you would like a slightly sweeter sauce. **I prepared 1.5 cups dry rice according to package instructions for this recipe. 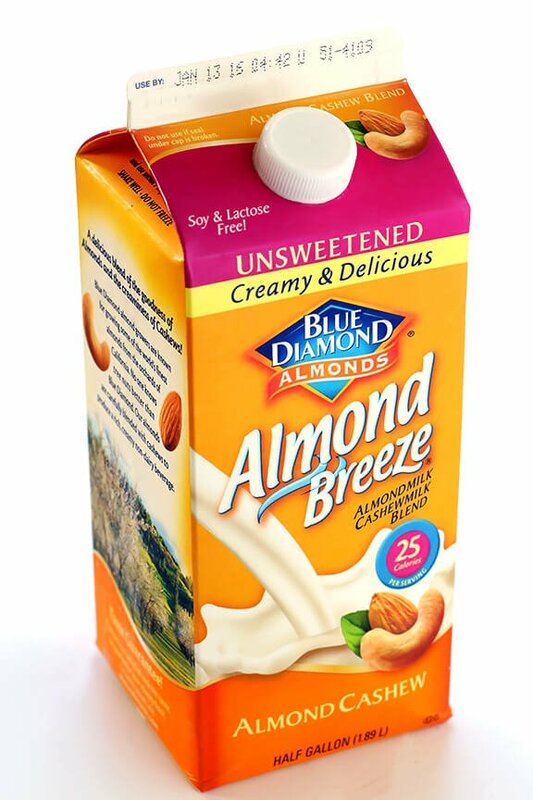 This post is sponsored by Blue Diamond Almond Breeze Almondmilk, maker of my favorite almondmilk (and now, almondmilk cashewmilk blend!). I am partnering with them to create some tasty new recipe to share with you, and all opinions are my own as always. Thanks for continuing to support the brands who help make this site possible!